Unearthing the Green Revolution, Part II: The story of how agriculture became agribusiness in California and around the world begins in Punjab, India, where the Green Revolution didn't just change how farmers work the land; it changed how they live. A farmworker squats barefoot on the ground, his toes blackened by soil. He pours weed killer into a plastic bottle and walks over to a flooded field of rice. He bends over, and fills the bottle with water. The mixture inside the bottle turns from yellow to a gleaming frothy white. He steps into the rice fields, the water splashes beneath his feet, and the weed killer sprays like a fountain from his hands. The land he's working is in a village called Rasulpur in the state of Punjab, in northern India. It's my ancestral farmland, and first belonged to my great grandfather. But today, no one in my immediate family farms it. Most of my family lives outside of India. This land is leased to a farmer, with no relation to us, whose name is Ravinder Singh. The farmworker who’s spraying the weed killer, while barefoot, works for Singh. I pick up the weed-killer carton to read the label. It’s written in English. Singh asks me what it says. I tell him it says you should be fully protected when handling the weed-killer. I tell him, maybe you should. 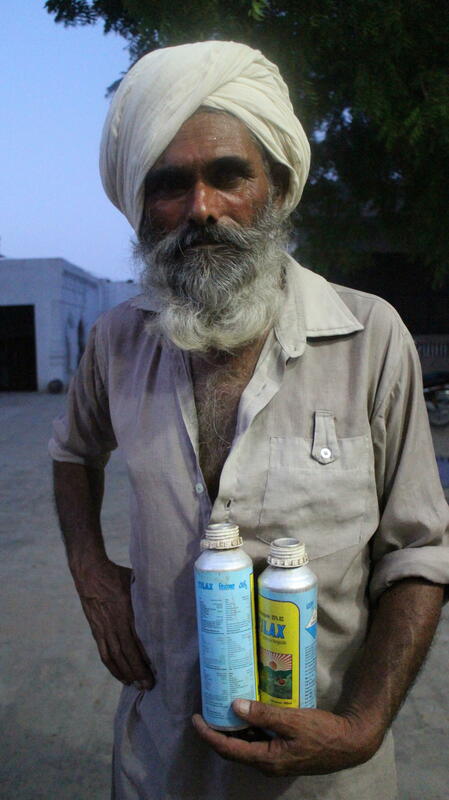 Singh thinks that he and his workers have become immune to the effect of the chemical sprays because they use them so often. He says that his crops need chemicals to grow. He admits they can cause health problems, but they make a tough job a little easier. Punjab has a population comparable to New York state, but living on half as much land — and agriculture is the largest industry in the region. Sixty percent of the state’s workforce is made up farmers living in rural villages. The majority are subsistence farmers, or family farmers, who own less than 10 acres of land. Ravinder Singh says his children won’t be farmers. One of his daughters has already moved to Canada on a student visa. He says there’s very little profit in farming these days. The average annual income in Punjab is about 65,000 rupees, which is about $1,000 per year. I ask him if he’s ever thought of selling his land. Singh says production costs have risen and that he’s in debt. In fact, a study conducted by the Punjab Agricultural University found that nine out of 10 farmers are in debt. The average amount owed is about six times the average annual income. So how did Punjab, the land of the five rivers, come to drown in debt? Sukhwinder Pappi is a member of the Association for Democratic Rights, an NGO that has worked closely with farmers in Punjab. He says to understand debt, you have to go back to the Green Revolution. As farmers produced more crops, they had to buy new technologies. That meant heavier and heavier loans. But the consequences are far worse than debt. The Punjab Agricultural University estimates that at least 7,000 farmers have committed suicide in the past 15 years. Pappi says the actual total could be triple that. He says that farmer suicides are reported everyday in the newspapers. One day, I opened up a local paper to see that two farmers had committed suicide on that very day, in the same district I was reporting in. Karamjeet Kaur is an activist with a farmers organization called Bhartiya Kisan Union, or BKU. She lists the names of the dead farmers from her village. "Gurwinder Singh, son of Dalip Singh," she says. "Dayal Singh Mistry: his father is Kaka Singh. Gurpreet Singh, son of Biri Singh." Kaur says that a train runs through her village. In the past few years, she knows at least five farmers who have stepped in front of it to commit suicide. "They leave behind families, children, elderly mothers," she says. "The lives of their families are filled with suffering. It’s unbearable." Kaur and I go to a village called Begelehre, near a city called Bathinda, in rural Punjab. We enter a temple, where a group of villagers surround me. Their despair is palpable. One of them is a 45-year-old widow named Kuldeep Kaur. She tells me her husband was a farmer who committed suicide because of debt. Her son was in 10th grade when he died. Kaur's body begins to shake as she sobs. The women around us start speaking at all once, encouraging her to stay strong. Kaur says there’s a great burden on her family. They’re still 500,000 rupees in debt – about $8,000. They had to sell their land. The Punjab government created a policy to provide compensation to families of farmers who had committed suicide. But Kaur says the government hasn’t provided any for her family. Paramjeet Kaur is an activist representing 28 villages in the women’s wing of the farmers union, BKU. But Dr. P.S. Rangi disagrees with that argument. He’s a retired professor from the Punjab Agricultural University. He was a consultant to the Punjab State Farmers Commission for about 30 years. Punjab’s grain production tripled in the decade after the Green Revolution. Why then, I ask, are so many farmers committing suicide in Punjab? “Suicides aren’t happening because of agriculture,” he says. “It’s complex. Suicide is in every section. Do you think students don't do it? Women don’t commit suicide? Is the rate of farmer suicides more than the rest of society? Not. It is at par." But, actually, it is not the same. The rate of suicide among Indian farmers is about 50 percent higher than the national average. The most common way to commit suicide in India is by ingesting pesticides, which suggests farming communities are the ones most affected by suicide. I ask Rangi what he thinks is the cause of farmer suicides. In fact, a study from Punjab Agricultural University found that the primary reasons for farmer suicide were poverty and debt. Research conducted by the agriculture commission found that 40% of the farmers of Punjab were willing to transition into other sectors, he says, and he thinks they should. But the farmers' unions thinks this is just the government’s way of getting rid of small farmers. Harinder Kaur Bindu is the president of the women’s wing of the local BKU chapter in the cotton-growing Bathinda region of Punjab. Bindu and three other women from BKU get out of a small car that has two giant megaphones affixed to the top. 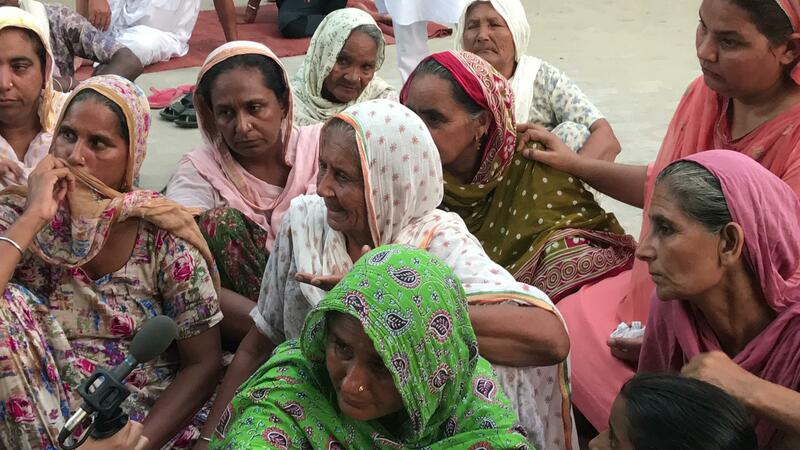 They’re traveling from the sprawling city of Bathinda to a small village on its outskirts, Begelehre, to talk about upcoming actions to demand the government help pay back farmers' loans. Bindu is standing on the roof of the village Gurdwara, or Sikh temple, using the temple speakers to call all the farmers, farm workers and their families to assemble. She has a history of leading successful demonstrations in this village: Several months earlier, the state government acquired the land of a village farmer, Jaswant Singh, to build a market. But when Singh came to collect his compensation, he was refused by a government agent. After three months of pleading, Jaswant Singh committed suicide in the government office and left a note accusing the agent, who was finally arrested by local police after eight days of sit-ins and protests by Bindu's local BKU chapter. Tonight, 50 or 60 villagers gather around the temple in the evening light. They are mostly elderly men and women. The men hold green and yellow flags with the BKU logo. It’s a white circle with a farmer and his oxen plowing a field at the center — the way farming in Punjab used to look before the Green Revolution. Unearthing the Green Revolution, Part I: California's fertile Central Valley is home to a sizable community of farmers from Punjab in India, a region also famous for its rich cropland. Why they came to the United States is a story as layered and complex as the politics and science of the crops they cultivate.